For this post, WOTW will be looking at a phenomenon in the Middle East: growing labour activism in Iran. When Iran comes to mind, the topic of conversation is generally the same: state-sponsored terrorism, their controversial nuclear power program, the Ayatollah and his theocratic regime. There is another thing that is proving newsworthy in Iran and that is the topic of this blog post: the growing labour activism in the country, something Western media has been extremely absent in reporting (not surprisingly I might add). During the last decade, Iran has witnessed a humble revival of labour and civic activism. 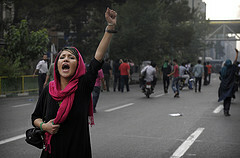 Starting as early as 2004, two Iranian workers committees had formed (one in 2004 and then one in 2005); both forming on May 1st, which is of course International Worker’s Day. The forming of these committees was a response to a violent attack that had occurred in 2004 with the unjustified shooting deaths of four Iranian copper miners by government officials (Iranian “special guards” who are essentially trained government goons).The first committee, the Committee for Co-ordination to Establish Workers’ Organization began by listing the names of three thousand workers who had agreed with their foundational goals such as the need for independent unions, job safety, fairer wages, women’s workers rights, etc. The committee even took positions on neighbouring wars going on at the time. The second group, the Committee for Continuation of Establishment of Free Workers Organizations in Iran was more of a group which took a more moderate approach that focused on legal advocacy and relying on existing labor institutions like Iran’s Ministry of Labour and the ILO. The Iranian labour movement is also said to have had somewhat of a hand in the influencing of the Iranian “Green” movement of 2009. The Green movement was a political movement that came out of the 2009 Iranian general election where mass protests were demanding the removal from the just-elected Mahmou d Ahmadinejad who had (supposedly) won the election (there were many allegations of vote rigging). The reason for the colour green was because the opposing candidate, Mir-Hossein Mousavi’s campaign colour was green. The colour became less about Mousavi and more about an independent movement which represented among many things a call for democracy, social liberalism and human rights. The Green Revolution represents the largest protests since the all-famed 1979 Revolution. Though labour’s involvement with the movement has not really been studied yet, it has been said that their contribution (such as in terms of simple participation), along with other civic organizations, student organizations etc. was somewhat significant. However, Iranian labor as a group did not and still have not fully joined the movement en masse, perhaps because of its failure to touch on key issues pertaining to specifically to workers. Even though there seems to be some, albeit minor, movements in the labour world of Iran, the current picture for organized labor rights is still grim. The government continues to crack down on labour unrest in the form of brutal raids and still deems independent organizations for workers to be illegal. In 2012, to give just one example, 50 prominent labour activists were arrested by Iranian security forces. This came after Amnesty International called on Iran to release activists during the celebration of the ILO’s 101st Anniversary. In a more recent example from October, the intelligence unit of the Revolutionary Guard called protesting teacher “enemies of the state.” Labour activism, specifically for teachers, has been on the rise as they protest wages that are keeping them essentially below the poverty line. They are also protesting for their leaders that have been placed behind bars. Despite all this, the sad fact remains labour activism is still seen as a major national security offense in Iran and this will provide a major stumbling block for the development of a fully-fledged Iranian labor movement. Protesters during the 1979 revolution. However, this fact is not cause for complete dismay over the situation in Iran. The ’79 Revolution was in large part influenced by labourers who protested the unfair policies of the Shah. The current government’s policies are not much better. I believe that if the labourers can do it once, they can do it again and with the faltering Iranian economy and constant repression, something’s gotta give.